spurgeonblog: The Real Life People and Places of "Cars"
The Real Life People and Places of "Cars"
The success of the latest Pixar film, "Cars", has triggered a wave of renewed interest in Route 66, and a whole new audience for the tremendous Route 66 News blog. This blog a real labor of love...dozens of posts each week covering everything from the latest renovation of some store or theater along the route to reviews of books about the highway and its history. One of the recent gems is an amazing post about the real-life people and places portrayed in "Cars". For instance, did you know Sally the Porsche, portrayed in the film by Bonnie Hunt, is based on Dawn Welch, owner of the historic Rock Cafe in Stroud, Oklahoma? Or that Fillmore, the VW microbus voiced by George Carlin in the film, was inspired by Route 66 artist Bob Waldmire, who drives up and down Route 66 in his own VW microbus selling his wares? 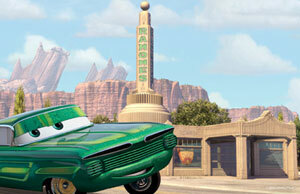 Or that the bridge that Sally and Lightning McQueen drive over is actually the Colorado Boulevard Bridge in Pasadena? 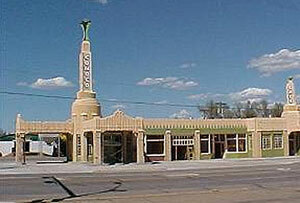 Or that Ramone's body-art shop in the film (see images above) is directly inspired by the U-Drop Inn, a recently restored Art Deco gasoline station and restaurant complex in Shamrock, Texas? Check out the blog post for the real-life stories behind the people and places in the film.